I grew up in Alberta and part of my story of becoming Québécois includes the year I spent on the Îles de la Madeleine working as a Language Monitor at the Polyvalente des Îles. In an instant, I went from prairies to beaches. My fascination with the Québec coast continued through Montreal neighborhoods like Verdun and through towns like New Richmond, Gaspé and communities on the Lower North Shore of Québec. I would always find myself braced against the cold wind looking at fishing boats, wondering about how life and work on the shore was changing with the decline of cod and the rise of crab and lobster. Last month I was talking to Elizabeth Miller, a professor at Concordia University’s Communication Studies department who recently developed an educational resource called the Shoreline Project, a bilingual interactive resource that profiles how educators, artists, city planners, scientists, and youth organizations from nine countries are confronting coastal challenges with resilience and imagination. It got me reflecting about life on the coast in Quebec. I wondered about the opportunities young people have in school to ask questions about their history, the geography and how the local economy is linked to the global economy past and present. Not surprisingly, I’m not the only person thinking about these things. Last spring, I was sent a link to a bilingual blog students in the Littoral School Board developed called Life on the Coast – La vie sur la Basse-Côte which is telling stories about life on the Lower North Shore of Quebec. After reading these posts, I wondered what these youth have in common with other youth in communities on the shore of the St Laurent or even coastal communities across the globe. On Wednesday, October 24th, Elizabeth and I are hosting an interactive webinar that includes a tour of the Shoreline project site and educator guide. This will also be an opportunity for teachers, community partners and youth interested in collaborating on a provincial project to meet and explore connections around a common coastal history. This is in addition to being connected to global campaigns that raise awareness around the effect of climate change on communities situated on the coast. The Shore Line – trailer from ShoreLine on Vimeo. Last week, I had a conversation with Elizabeth to talk about whether this is an example of a transdisciplinary project teachers, students and community groups in Quebec might be able to integrate into English and French classrooms. Below is part of our conversation. Can you tell me about why you developed the Shoreline Project? How can we foster the necessary skills for collaboration and community care in our schools? How do we balance the urgent need to act with the need to build resilient, sustainable classrooms and communities? Many communities across Quebec exist on the shore of the St Laurent River and the Gulf of St Laurent. What are some ways young people in these communities can engage in telling the stories of their own shoreline? Many teachers have been using the website as a prompt to get their own students involved in visiting and observing local rivers and shorelines. Water and coastlines connect us naturally and are great prompts to get young people involved in protecting the resources around us. So for example I teach a video production class of 24 students and I sent out eight teams of 3 to document changes along the Montreal coast. Then together we made a collaborative video. Sustainability is largely about relations and I would love to convene a group of teachers along the St. Laurent River who are invested in protecting this vital resource! In your opinion, what are some of the ways a teacher can use the online resources? The website has 43 unique videos from nine countries. Each video is two to five minutes and is connected to a set of guiding questions and follow up resources. Teachers can use our 2 to 5 minute short videos to prompt discussions or assignments around issues like ethics or sustainable architecture or whatever theme they are working on. For example, I have had teachers assign a few videos and then facilitate exercises on ethics, on community based engagement, on place-based storytelling and more! 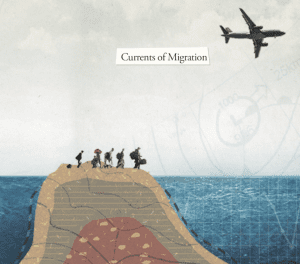 We also have one-pagers to help teachers who are doing classes on local governance, indigenous worldviews, migration, or even speculative futures. 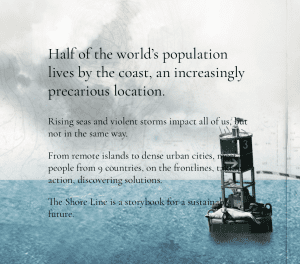 In an ideal world, how will teachers and students use the shoreline project resources? Ideally teachers will use this project to build environmental and media literacy. The goal is to inspire students and serve as a prompt to connect them to the valuable natural resources around them and to see how they can get involved in making a difference. To participate in the Shoreline Project Webinar -register here. I really enjoyed this blog. This project is truly a community driven project that draws in people from all corners of Quebec. Moreover, its relevance and timeliness is unquestionable. Well done!